Last weekend, we had a doggie guest all weekend and the dogs had a blast. 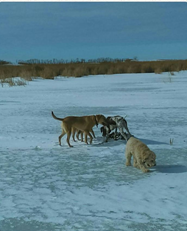 The weather was warmer and the water was still frozen over, so the dogs had to check things out on the ice. Of interest were two muskrat dens and the coyote tracks leading up to each one. 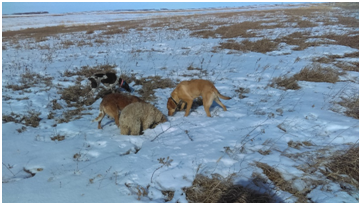 Kota was quick to point out the coyote sign to me and had all the other dogs pointing out sign before too long. Coyote mating season is upon us and they are marking everywhere leaving calling cards and trying to stake out the territory again, including out on the ice. Kota is doing well pointing out sign all over the property here. Soon we will be able to head out and try to find sign other places. Can Collars Cause Thyroid Damage?